Essex County Council has a new blogging platform. In this post I’d like to talk about how we built it. The guiding principle was not to reinvent the wheel. We worked with the external provider DXW, used WordPress, a widely supported, easy-to-use platform, and based the design and coding on a publically-available, well tested template: in this case the one used by GOV.UK blogs. The platform is used widely across central government, with the MOD, HMRC, as well as the NHS all using installations, so we were happy it met our security criteria. We built it quickly, in a two week sprint, working with 2 developers and a delivery manager from DXW. At the start of the project - after deciding the approach of using wordpress - we developed a series of user stories, rather than working to a set of business requirements. A user story is a way of describing some functionality or thing which a user needs the product to do. These user stories were the basis of everything. 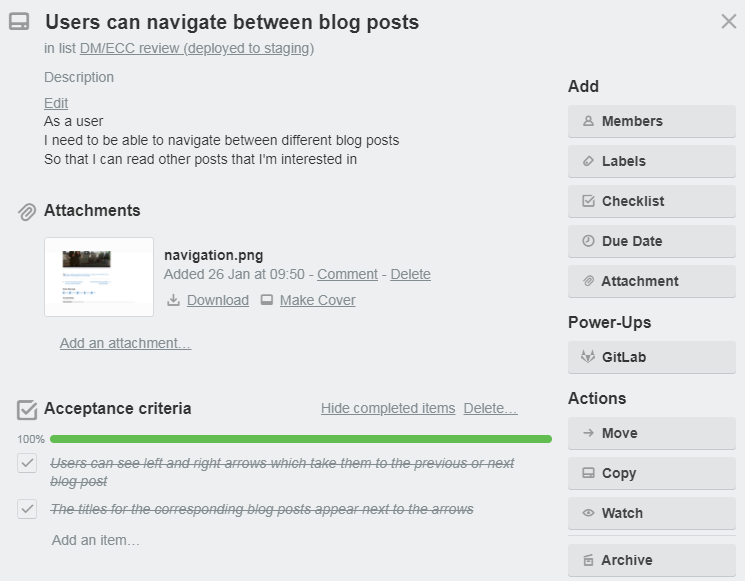 Each one had an acceptance criteria - this makes it easy to know when each task has been ‘done’. 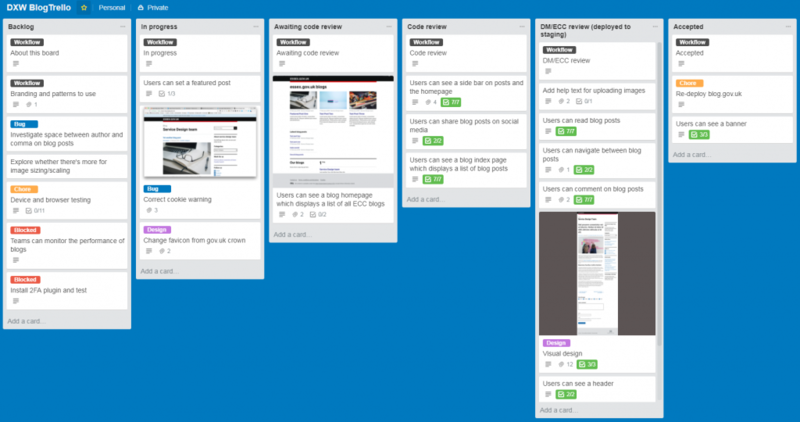 All the user stories went into the Trello board as individual cards. As they moved across the journey from backlog through ‘code review’, ‘client review’, to ‘done’ the delivery manager prioritised them, and marked as ‘blocked’ where appropriate. The pace was really surprising. Every time I looked at the board things had moved. And often when I came back to my computer after a meeting, I’d notice that I was the one who was blocking things. As a delivery manager it’s normally my job to do the unblocking! It was exhilarating making something so tangible in just two weeks. That said, trying to keep pace with a truly digital organisation like DXW really highlighted how slow some of our internal processes and systems are and how we tend to accept this as the norm. As well as the obvious speed advantages, using a codebase borrowed from central government illustrates a broader principle. As Jason Kitcat has said, the principle should be borrow, don’t build. Our problems are not unique: there are people all across central and local government facing very similar challenges. Sharing tools, templates and patterns is widely established across parts of central government and there’s lots to gain for ECC making this part of its culture. Hopefully this blog will help us connect with teams across the council and country facing similar challenges. As we found in this two week sprint, using and sharing existing patterns and templates makes it faster, cheaper, and easier to create user-centred services. The service design team are piloting this blog. We’ll soon work on steps on how it could be rolled out to other teams in the future. And over the coming months we will be documenting our work here, as part of our commitment to working in the open. As well as our show and tells, this blog is one way we share what we’re up to.